Times change, customs change, needs change... and these changes mean that the concept of comfort is also continually evolving, developing in step with technology. And, in the world of boats, the well- being experienced and the quality of onboard life are changing rapidly, becoming increasingly "enjoyable" even for those unaccustomed to life at sea. Today, partly due to strong growth in the superyacht- chartering market, which has brought so many neophytes onboard, the "tolerance" threshold for boat movement, rolling in particular, is becoming lower and lower. The market is therefore demanding boats that are increasingly "still" and not vulnerable to wave movement either when sailing or at anchor. It seems as though this is the aspect recently most studied by stabilisation-system specialists. Although technology applied to control of trim when sailing has already been studied in depth, with undoubtedly satisfactory results, stability when stationary is a problem, at least for pleasure boats, that has only been dealt with recently and that is certainly more difficult to solve. Without the speed factor which makes the usual stabilising appendices installed on the bottom effective when a boat is travelling, different forces are required in order to oppose the oscillation caused by wave movement. There are various systems on the market, differing according to means of operation and manufacturer. We went to "discover" the system developed by the Italian firm, Rodriquez Marine System. We interviewed Alessandro Cappiello, the person managing this company specialising in trim-control systems for yachts and commercial craft. The problem of stabilising pleasure boats at anchor is becoming more serious everyday even if, to tell the truth, this is not a new problem for boat designers. On the contrary. Military boats in particular have always required this stability. Not, of course, to improve crew comfort, but to keep the firing platform stable, since the greater the stability, the greater the firing accuracy. 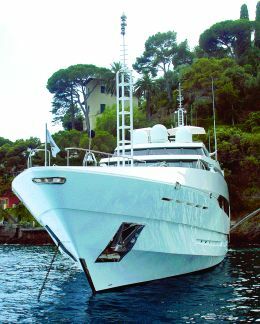 Pleasure boats are obviously smaller than military craft and the systems conventionally used for large ships, such as the famous active or passive "stabilising tanks" are out of the question for motoryachts because of their bulk, weight, and various other factors, not least of which is the cost. What alternative do you propose? We began by dealing with two very different problems at the same time. The objective: to stabilise a boat both when it is travelling and when it is moored or at anchor, with the idea of using the same system to solve both problems. The physical problem with a stationary boat is how to activate a fin system that is not struck by a flow of moving water, since it is speed that creates the lift on all wing profiles. If there is no speed-generated water flow, there is no lift and hence no stabilising effect. That is more or less the concept. To solve the problem, we decided to adopt the same strategy used by other companies, given that our system also uses fin movement (downwards) to compensate for the force generated by the boat's movement. Continuing with the "aeronautical" comparison, it's like the beating of a wing? Exactly. With the beating of that wing, we must attempt to cushion the acceleration transferred from wave movement to the entire mass of the boat. We must create an opposite force proportional to that of the boat's roll. Generally speaking, this is the basis of active-stabilisation systems. How did you develop this concept as compared to your competitors? We sought to develop a system that was equally effective in all situations, whether when sailing or at anchor. Let us say that, with an active- stabilisation system, one of the fundamental aspects is the fin geometry, because the effectiveness of the system varies according to how the fin is designed. The geometric wing shape creates a specific lift coefficient, which determines the wing's lift. Therefore, modifying the shape of the fin causes a variation in the LC. We attempted to improve the concept of active stabilisation by first of all giving the fin a more favourable LC. Many designers install trapezoidal fins, which must be very large because they are less efficient and which require a great deal of power to move. We, on the other hand, observed that the more rectangular the fin is, the better the system performs without having to make use of particularly large surfaces. It is not only a fin's surface that determines how efficient it is. 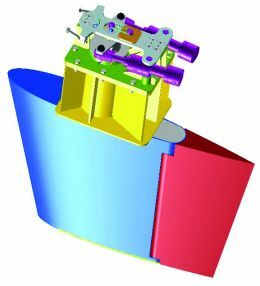 A one square-meter wing, for example, can be designed with a thousand different shapes, obtaining a range of results that are more or less effective. We studied the best fin profile and geometry and ended up designing a fin with a relatively high aspect ratio. The result is excellent system performance when the boat is sailing and an excellent cushioning effect when the boat is stationary. What most conditions the fin's shape, apart from the lift coefficient? Undoubtedly, its bulk. If we could create a fin that was very long rather than wide, its anti-roll effect would be better but its very length would make it impossible to dock, since the fin would hit the quay. Its length must therefore necessarily be contained within that of the boat. Wouldn't it be possible to avoid this problem by creating "telescopic" fins? There are already systems with telescopic appendices but they are generally installed on large ships, again because of the problem of their bulk. In order to install wings of this kind, there must be space onboard for the holds that house them when they are retracted. For ships, this is not a serious problem but it becomes a very complex issue on a pleasure boat. We, on the other hand, worked to develop the control software, the system's brain which, when coupled with the fins' hydrodynamic shape, increases the cushioning effect and achieves excellent results for both moving and stationary boats. Yes, the movement must be as wide, powerful and instantaneous as possible because, when the boat is at anchor, an acceleration must be generated so that the fin has the lift needed to cushion efficiently the acceleration to which waves subject the boat. When the boat is cruising, on the other hand, the wing, as you pointed out, is moved with a rhythm that is more fluid and continual and much more contained. Yes, but what determines how and when the fins operate? As I mentioned, everything is entrusted to electronics, to the management software we developed using the know-how we have acquired with both pleasure and naval craft, a field in which we have a great deal of experience. The result is that our system is of the highest quality and efficiency. We have reliable hardware and two software programs for control - by simply pressing a button on the control station, the operation of the fins can be set either for sailing or for the boat at anchor. Thanks to sensors such as accelerometers, inclinometers and impact recorders, the software, autonomously and extremely accurately, acquires the information (such as the state of the sea - the cause of rolling - the period, the speed, the acceleration and the angle of the boat's oscillation at that exact moment) needed to determine optimal system operation. It then processes this data in a few seconds and calibrates the functioning of the fins. Is there then no need for an operator? The system is totally autonomous and, within 15/20 seconds of being activated, is fully operational. Obviously, its effectiveness is due to precisely calibrated and timed reactions because the fin must fulfil its function at a very precise moment, synchronised with the boat's movement. If this was not the case, if the fin movement was in counter- phase with respect to the roll, the roll would become even worse. And if the state of the sea changes, if another boat passes alongside our boat, generating further wave movement, what happens? The system is able immediately to "feel" any variation whatsoever and instantly adapts to the new situation. How much does the cushioning effect generated by your system reduce the roll of a boat at anchor? Our practical experience, made at sea, has demonstrated that the roll reduction is around 70%, an impressive result when we consider that it is achieved without affecting the operation of the system that stabilises the boat when it is travelling. Do the fins generate noise when they move? The fins themselves, no. They are moved by a hydraulic system consisting of pumps and actuators which normally generate a few decibels. With a highly efficient wing installed that does not require great force in order to be activated, we have successfully installed a power system that is very contained with respect to that required by our competitors, meaning that the noise generated during operation is considerably reduced. I would say that it is only barely perceptible and then only in limited areas on the boat.